Experienced family dentist in Carlisle, PA.
Dr. Robert Serafin and Dr. Tamara Shore are here to serve patients in Carlisle with a full range of general and cosmetic dentistry services. As an experienced family dentist in Carlisle, PA, each of our doctors is dedicated to maintaining a high standard of care and ensuring our patients enjoy lasting results with their treatment plan. Turn to us for all of your general, cosmetic, and restorative dentistry procedures. We are also a provider of pediatric dentistry services, ensuring our younger patients receive the quality care they need to adopt good habits at an early age. We typically schedule our new patients for a one to one and a half hour initial visit which includes a comprehensive oral exam by your doctor, x-rays, oral cancer screening and a periodontal evaluation! You will meet either Dr. Serafin or Dr. Shore on your first visit to see a dentist in Carlisle, PA. Both of our doctors have completed extensive training in their field and will work with you to create a customized treatment plan that meets your needs. We will take some time to go over your medical history, oral health history, and treatment goals during your consultation. A comprehensive exam will give us a better idea of the current state of your oral health. We pride ourselves on serving patients with reasonable fees and competitive rates. Turn to us for special discount programs and flexible payment options. We accept most insurance plans and can also pro-vide information about CareCredit third-party financing. Your first visit can take up to an hour or more, depending on whether you are coming in for other ser-vices such as teeth whitening or a deep cleaning. Please bring the following to your first appointment: referral sheet and any recent x-rays, a list of medications you are currently taking, and medical or dental insurance information. 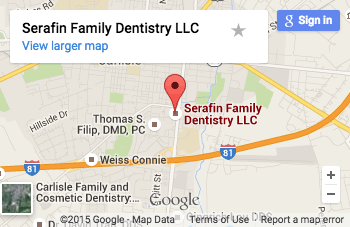 Learn more about our family dentist in Carlisle, PA, by scheduling your appointment today!